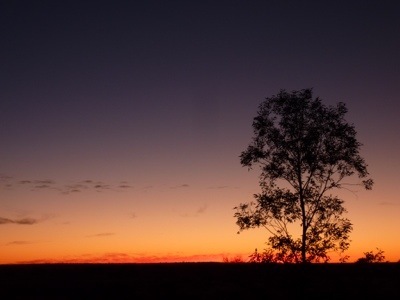 Three women, two men & a boy left Broken Hill about five days ago. 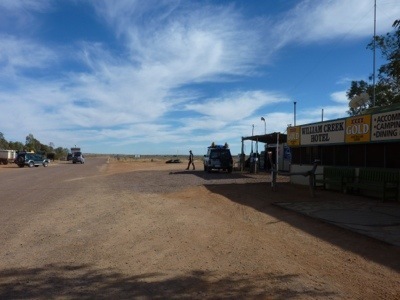 We have reached William Creek which is on the Oodnadatta Track. 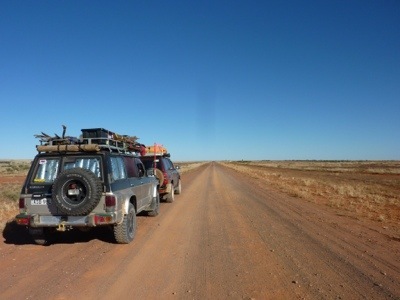 We are en route to cross the Simpson Desert in about a week’s time. 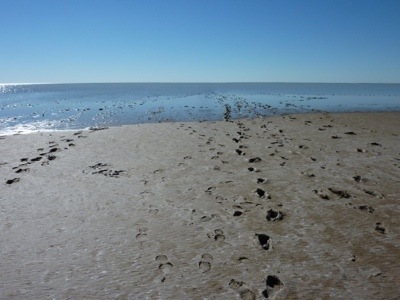 The traveling has been good with graders having done their work after the floods receded from the tracks. We amped at Broken Hill for two nights and then headed for Tiboburra. 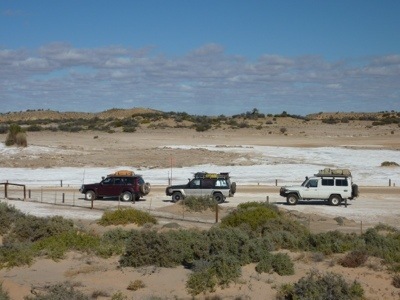 We had planned to get to Cameron corner but he going was very slow and so we made camp in the Sturt National Park at Dead Horse Gully. The scenery was stunning and the camp site situated among the desert brush & jump-ups. The days have been warming up with big blue skies – but the temperatures at night have been freezing – literally! We then set off for Cam. Corner on a good track crossing the dunes. The desert has been abundant in its green dressing. After lunch at the “Yellow Bus” we camped at Montecolinna Bore on the Strezliki Track and, despite the freezing temperature in the evening, we all enjoyed mother nature’s spa bath in the bore – a balmy 38ish degrees. 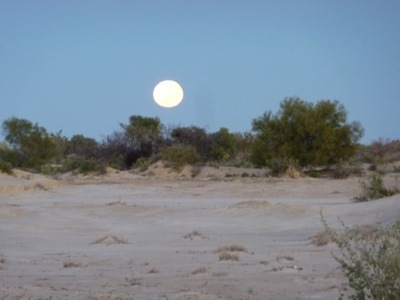 The landsce was lunar with the full moon shining on the white sand. 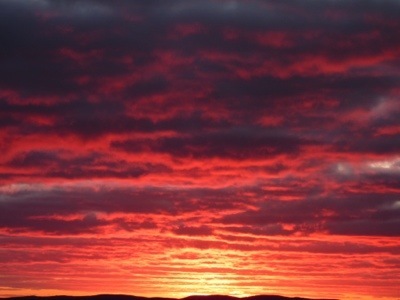 The dingoes howled and one was silhouetted against th setting sun. The next day headed down the S Track & camped at Farina Ruins. 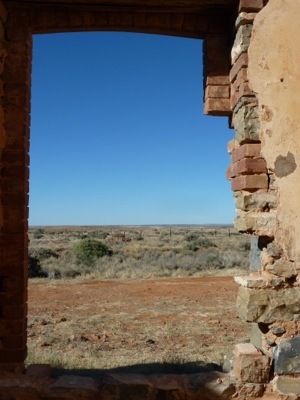 The ruins are being restored but are testament to the early pastoralists & rail workers servicing the Ghan. 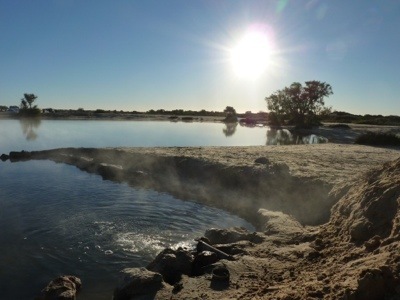 The camp was beautiful – an oasis in the desert landscape. 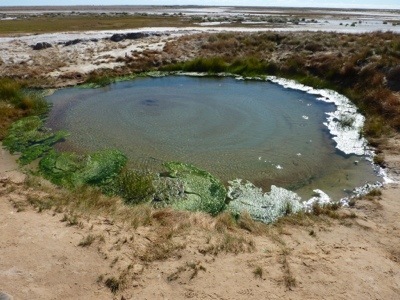 This morning we stopped to wonder at Lake Eyre South – majestic yet sultry – with water in it then on to William Creek via the Bubbler, Blanche Cup & Cowards Springs – all mound springs bubbling up from deep within the earth providing living conditions for algae & fish found nowhere else. Windy and sunny at William Creek – good day for drying:). 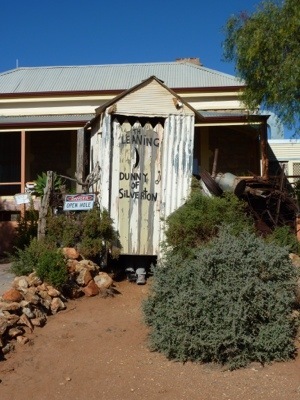 Posted my friend Rowena’s wedding stubbie holder on the wall of the pub as a fitting resting place for all to admire.